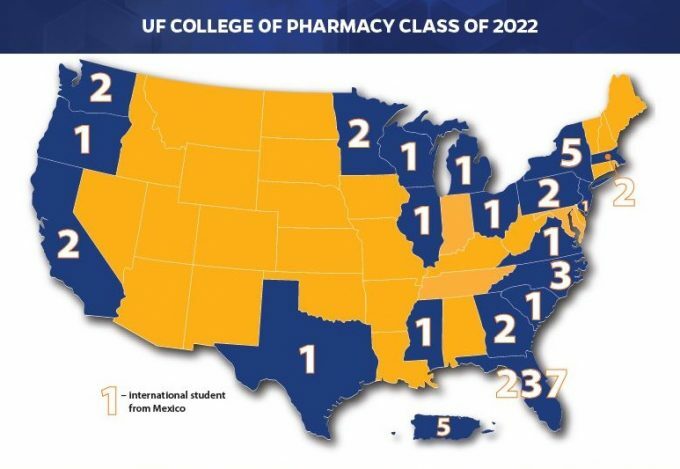 The journey toward a pharmacy degree from the University of Florida began Aug. 13 for 273 members of the Pharm.D. class of 2022. Students arrived at day one of orientation eager to meet their new classmates and professors. While the majority of the class call Florida home, 37 out-of-state students from 18 states and Puerto Rico, bring new perspectives from different areas of the country. UF College of Pharmacy Pharm.D. Class of 2022 at orientation. Orientation week began with the class of 2022 gathering in Gainesville. All 273 students from the Gainesville, Jacksonville and Orlando campuses received an introduction to the curriculum and learned their team assignments. On day two, the students returned to their respective campuses and participated in activities via the college’s state-of-the-art video conferencing. Orientation activities included development of the first class creed and social events to encourage team building and interaction with their new classmates. More than a dozen faculty, staff and campus leaders addressed UF’s newest pharmacy students during the week. Julie Johnson, Pharm.D., dean and distinguished professor at the UF College of Pharmacy, highlighted some of the unique qualities that makes UF a Top-10 ranked pharmacy college and challenged students to keep an open mind about their future careers. Members of the class of 2022 call 19 states home as well as Puerto Rico and Mexico. Members of the class of 2022 came to UF and decided to pursue pharmacy for various reasons. For Aubrey Murphy, a first-year Pharm.D. student from Miami, pharmacy became her career interest as a freshman in high school. Two years ago, Murphy shadowed a clinical pharmacist at a South Florida hospital. The experience opened her eyes to the responsibilities and respect that pharmacists command in a health care setting, reinforcing her desire to become a clinical pharmacist. Students entering the UF College of Pharmacy’s graduate education programs in the fall 2018. In addition to UF’s Pharm.D. students, 23 first-year Ph.D. and three residential masters students arrived in Gainesville for orientation on Aug. 15. 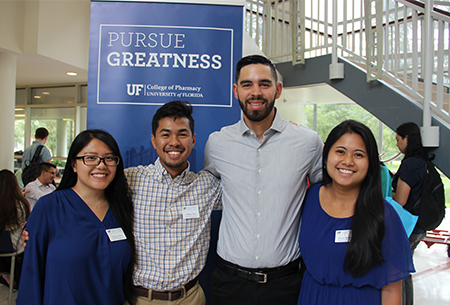 These aspiring pharmaceutical scientists spent their initial days at UF learning about the graduate program and the many benefits to living in Gainesville. Maureen Keller-Wood, Ph.D., associate dean for research and graduate education, and Jeremy Coleman, a fourth-year student in the department of medicinal chemistry and president of the college’s Graduate Student Organization, provided welcome remarks at orientation. View photos from Pharm.D. Orientation at https://ufcollegeofpharmacy.smugmug.com/PharmD-Orientation-2018.